Playing scales on the harmonica can be very useful. If you take two notes an octave apart and add some of the pitches that lie between them, you’ll have a scale. With 12 different pitches to choose from, you have endless possibilities. However, most music uses a few standard types of scale. You can simply name which notes belong in the scale. However, those names are usually determined as a result of the other two methods. You can describe the size of each step in the scale as you ascend from one scale degree to the next, starting with the tonic. Most steps are either a semitone (S) or a whole tone (or T, for Tone). Each type of scale has a specific pattern of tones and semitones that describes its ascending steps. For instance, the step pattern for a major scale is TTS TTTS. You can name the quality of the interval that each scale step forms with the tonic. Scales fall into two large categories, diatonic and chromatic. A diatonic scale contains the 7 notes that belong to one key, such as the white keys on the piano. A chromatic scale includes all 12 notes of an octave (13 if you count the note that completes the octave). The chromatic scale is sort of like a complete inventory of notes and isn’t considered to be in any one key. The step pattern of a chromatic scale is simply SSSSSSSSSSSS. If you’re playing a tune that uses a diatonic scale but borrows a few notes here and there from the chromatic scale, those added notes are also considered chromatic notes. 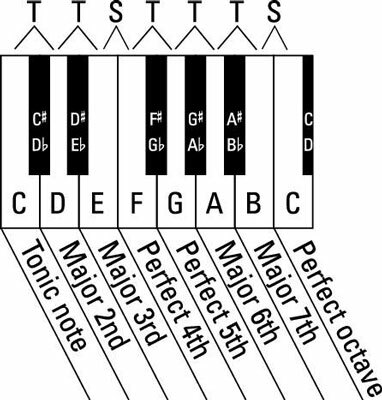 Take a look at the step pattern for a major scale and the interval qualities for the scale degrees in relation to the tonic. The scale shown is the C major scale, but the pattern and relationships are the same for all major scales. The scales available on a C-harmonica fall into three groups: major, minor, and weird (at least until you get to know them). Major and minor scales have several distinguishing characteristics. It has a major 3rd degree. It follows the step pattern of TTS TTTS if it’s a standard major scale. It may be considered major in character as long as it has a major 3rd degree, even if it doesn’t conform completely to the TTS TTTS pattern of a true major scale. F: One natural note (B) has to be lowered one semitone (to B♭ó) to create a major scale. G: One natural note (F) has to be raised a semitone (to F♯) to create a major scale. G is the most popular key for playing a C-harmonica, even more popular than C.
It has a minor 3rd degree. The 6th and 7th degrees may be major or minor. The natural-note scale of A is considered the “natural” minor scale. It has minor 6th and minor 7th degrees. Some of the other types of minor scale are considered alterations of this scale. A: This is considered the “natural” minor scale. D: This scale has a major sixth (B) that gives it a strange, haunting quality. This is the most popular minor key on a C-harmonica. E: This scale has a minor 2nd degree that gives it a vaguely Middle-Eastern quality. The natural-note scale of B has a minor third, but it’s unique in that it has a diminished fifth, which makes it hard to work with. C major and A natural minor use the same set of notes, but by centering those notes around one tonic or another, the scale becomes major or minor. When a major scale and a natural minor scale share the same notes, the major scale is called the relative major and the minor key that shares those notes is called the relative minor. If you look at the scales on the harmonica that have a major or minor character, A is the relative minor of C, while D is the relative minor of F and E is the relative minor of G. Knowing these relationships helps you deal with songs that go back and forth between relative major and relative minor keys and chords. While you can buy harmonicas tuned to minor keys, most harmonica players play in minor keys by playing a standard major-key harp and choosing one of its scales that has a minor third degree. This means, for instance, playing a C-harp in D minor, A minor, or E minor. You can take any note in a scale and designate it as the tonic. Each resulting scale is called a mode. If a scale has seven notes, it has seven different modes (or modal scales). Because most scales have step patterns that include a mix of whole tones and semitones, each mode has a different set of interval qualities. On the diatonic harmonica tuned to the C major scale, you also have modal scales for D, E, F, G, A, and B — seven different scale flavors. Each of these modal scales gives you the basis to play that C-harmonica in several different keys, each with its own scale flavor.